March 9, 2014 – On Saturday at 12:45 AM Malaysia time a Malaysia Airlines Flight MH370 departed Malaysia's main international airport, Kuala Lumpur International Airport (KLIA). Onboard the twin-engine Boeing 777-200 jet was 227 passengers and 12 crew members. The flight was to arrive in Beijing Capital International Airport about 6:30 AM about five and half hours later. Subang (Indonesia) Air traffic control reported they lost radio contact with Flight MH370 at 2:40 AM Malaysia time about 120 miles off the east coast of the Malaysian town of Kota Bharu, less than an hour into their flight. The aircraft was last known over the territorial waters of Malaysia and Vietnam (065515 North longitude and 1033443 East latitude), where the Gulf of Thailand joins the South China Sea. The two pilots have been identified as Captain Zaharie Ahmad Shah, a Malaysian aged 53 with over 18,365 hours of flight time and First officer, Fariq Ab.Hamid, a Malaysian, aged 27 with over 2,763 hours of flight time. A search of the South China Sea where Malaysian and Vietnamese airspace meet has now been the focus after Vietnamese search and recue planes spotted traces of a large oil slick. Authorities report this type of oil would be indicative of a residue from jet fuel. 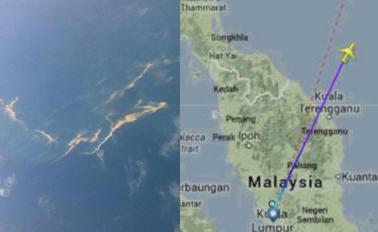 The oil slick is believed to be 6 to 9 miles long, it was located about 90 miles south of Tho Chu Island. Early Sunday morning Vietnamese search teams located part of what they think is a door and fragments that is believed to belong to Flight MH370. On Sunday Malaysia's air force reported that military radar indicated the Flight MH370 may have turned back toward Kuala Lumpur. There is growing speculation that the Boeing 777 may have been taken down by terrorist. Malaysia's Transport Minister Hishammuddin Hussein stated “We are looking for accurate information from the Malaysian military. They are waiting for information from the Vietnamese side.” Hussein further stated the pilots had good weather conditions and did not report any problems while in contact with ATC. Hussein was was questioned by reporters and asked if terrorism was suspected, Hussein said authorities “had no information but were looking at all possibilities.” There is speculation that because there is no debris field that the aircraft may have broken up “disintegrated” in flight at about 35,000 feet. There is growing peculation that Flight MH370 may have come under attack, as this was to be a routine flight, it was under good weather conditions. However, the fact that the pilots failed to make a distress call or contact ATC to advise them of a course change, that fact that the Boeing 777 had just recently passed a maintenance inspection. In addition, there lack a debris field. The only thing authorities have to go on is the oil slick, what is believed to be a door and small fragments that is believed to come from Flight MH370, the jet has vanished. When authorities contacted family members of passengers onboard Flight MH370 they quickly learned that at least as many as two passengers onboard had used stolen passports. Authorities believe they know the identities of the two individuals as they have the passengers on CCTV boarding the aircraft. Update - March 10th - On Monday authorities have reported that the oil slick was not from Flight MH370 they also reported that a yellow floating object that they thought could have been a life raft but that also turned out to be a false alarm. The head of Malaysia's Civil Aviation Authority, Azharuddin Abdul Rahman said “Unfortunately we have not found anything that appears to be objects from the aircraft, let alone the aircraft. As far as we are concerned, we have to find the aircraft, we have to find a piece of the aircraft if possible." 11 countries are involved in the search for Flight MH370, it includes Australia, Britain, China, Indonesia, Malaysia, New Zealand, Philippines, Singapore, Thailand, United States and Vietnam. Boeing, the FAA and the NTSB are also assisting.